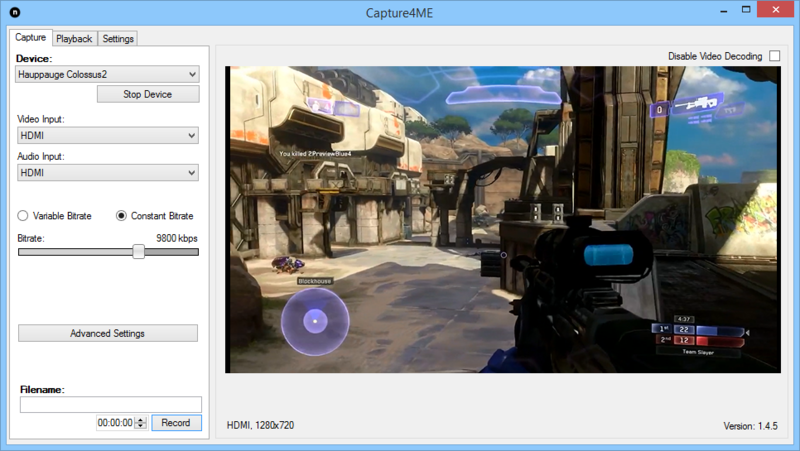 Capture4ME is a lightweight, easy to use application for capturing video. It allows you to easily view and capture video from digital TV tuners (ATSC, DVB, etc), specialist component/HDMI capture devices (like Hauppauge HDPVR & HDPVR2), Copy-Freely devices (like Hauppauge DCR-2650), or from analog devices (*). Capture4ME does not attempt to be an all-encompassing multimedia center or video editing suite. Instead we've focused on providing a great user experience for the simple task of watching and recording video feeds. That said, if you're looking for an all-encompassing multimedia center, we've got one of those too - head over to http://www.nextpvr.com. 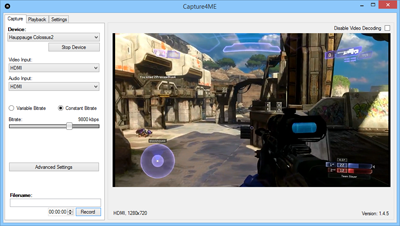 The Capture4ME software also includes basic video editing features, and the ability 'Upload to YouTube' for those that want to share their videos online. A full license for Capture4ME costs US$20. Without having a license installed, recordings are limited to a maximum of two minutes. Digital TV: Capture4ME is compatible with all major digital television standards in use world-wide, including ATSC, QAM, DVB-T/T2, DVB-S/S2, DVB-C and DMB-T. TS Capture will work with any device that has BDA drivers, and has been tested with a wide variety of devices from popular manufacturers like Hauppauge, TBS, BlackGold, PCTV, etc. Also supported are SAT>IP and HDHomeRun networked digital tuners. Component & HDMI capture: Capture4ME is compatible with specialist high definition capture devices like the Hauppauge HDPVR, HDPVR2, StreamEez, Colossus, Colossus2, Rocket, and the new HDPVR60. These devices are perfect for capturing high-definition video from set top boxes, video cameras and game consoles. See http://www.hauppauge.com/site/products/prods_hd-recorders.html. Also supported, in the same category of device, are the Roxio GameCap HD Pro and AVerMedia C985. CableCard Copy-Freely: Capture4ME is compatible with the SiliconDust HDHomeRun Prime, and the Hauppauge DCR-2650. With these devices, Capture4ME can view and record from any Copy-Freely or ClearQAM channel. Analog: Capture4ME is compatible with Hauppauge analog devices, (*) but only if the Hauppauge WinTV v7 application is installed first. 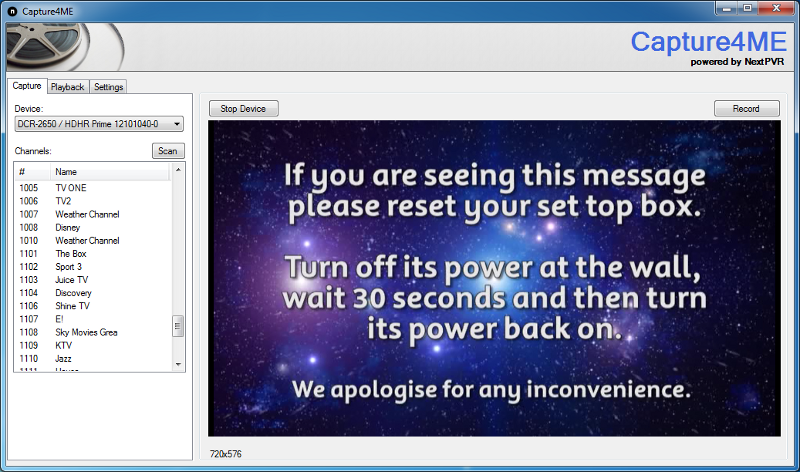 NOTE: Capture4ME requires you to have your own video decoders installed. It can use decoders included with Windows, or your capture device manufacturer's software, or decoders downloaded from the internet. For more information on decoder, please see our FAQ. You can download Capture4ME from http://www.capture4me.com/C4MESetup.exe. For those that prefer not to install applications, you can download the application from http://www.capture4me.com/Capture4ME.zip, and extract the files to a writable directory or thumbdrive, and simply run the capture4me.exe to start the app. Without having a license installed, recordings are limited to a maximum of two minutes. Use the 'Buy Now' button below to buy a license for Capture4ME. Be sure to the try the application first before buying a license as no refunds are available. A license key will be generated and emailed to you within the next 24 hours. If you need to buy multiple keys, or license OEM versions, please user the email link below to let us know your specific needs. License costs US$20. A license key will be emailed to you within 24 hours. License costs US$20. A license key and GST receipt will be emailed to you within 24 hours. Added support for AVerMedia C985. Other AVerMedia HD capture device may also work. Added support for several new types of devices (like SAT>IP and Hauppauge Colossus2 etc). 1.3.0 Using new mechanism for uploading videos to YouTube. Google has deprecated the old API we previously used. 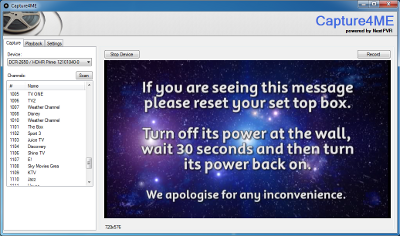 Fixed issue that could lead to crash when scanning with DVB tuners. Added a file name field next to the 'Record' button. 1.1.1 Fixed problem with ffmpeg download function, which enables the .mp4/.mkv/.m2ts export function. Increased maximum peak bitrate to 24Mbps for Colossus to match hardware capabilities. 1.1.0 Fixed problem where version number would not update when user installed new version. Fixed several small stability issues. Added ability to export recordings to .mp4/.mkv/.m2ts. Fixed timing issues in files that have been timmed. Function for cutting beginning/end of files now behaves well, and gives progress bars for these potentially long operations. 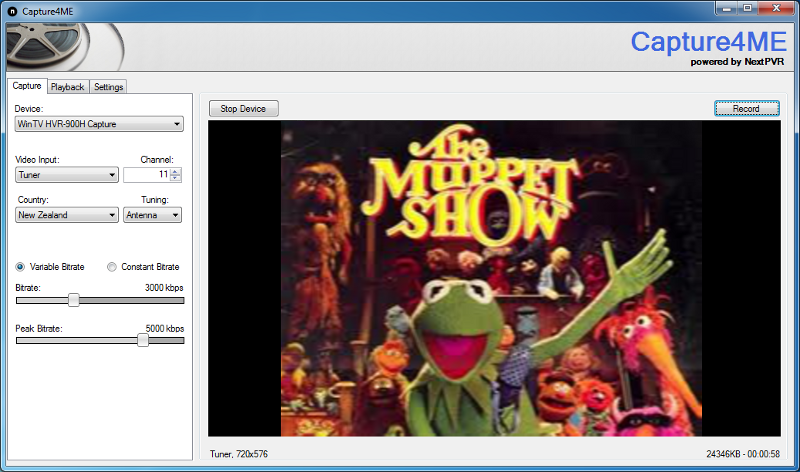 Added option to disable video decoding while capturing, which will be useful for users trying to capture H264 video on lower end machines. 1.0.9 Added support for Colossus SPDIF audio input. 1.0.8 Fixed a bug with the way Capture4ME was attemping to set the bitrate on Colossus. © 2014 Menten Holdings Ltd.